The Stay Puft Marshmallow Man is a fictional character in the movie Ghostbusters and the animated series The Real Ghostbusters. 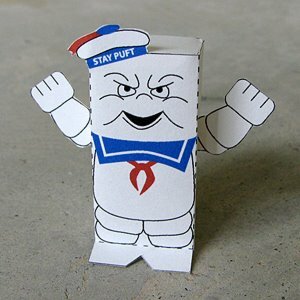 He was the cartoon mascot of the fictitious Stay Puft marshmallow corporation. Stay Puft's familiar mascot combined elements of real life brand ambassadors Bibendum (aka the Michelin Man) and the Pillsbury Dough Boy.